Everyone should have a yummy banana bread recipe on hand. The apple sauce in this recipe gives the bread a nice sweet fruity flavor while reducing the overall amount of sugar in the bread. The walnuts and flax seeds on top of the loaf give a great crunch and texture to the top of the loaf. 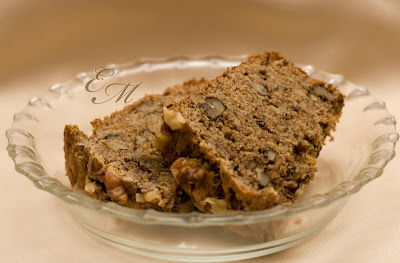 I love nuts in my banana bread but if you are not a nut lover than leave them out this loaf will still be yummy. In a large mixing bowl mix the butter and sugar and eggs together. Once mixed add, apple sauce, bananas and milk to the bowl and mix. In small bowl mix flour, flax seed meal, cinnamon, salt, baking soda, and baking powder thoroughly then stir into the banana mixture. After the flour and banana mixtures are well mixed stir in 1 cup of chopped walnuts just until evenly distributed throughout the batter. Pour batter into loaf pan and bake for 1 hour to 1 hour 10 minutes or until toothpick inserted in center comes out clean.